A preliminary analysis of the World Health Organization’s “ring vaccination” strategy against Ebola shows that vaccinating people who came into contact with Ebola patients is proving to be effective at preventing new cases and limiting the spread of the disease in the Democratic Republic of Congo (DRC). The analysis, conducted by the DRC’s national research institute, the Institut National pour la Recherche Biomedicale (INRB) and WHO, found that use of the vaccine, called rVSV-ZEBOV, has reduced mortality by between 88 percent and 97.5 percent among those who were vaccinated after being identified as having had contact with other Ebola victims. Since implementing the ‘’ring vaccination’’ strategy, which began seven days after the declaration of the outbreak in August of 2018, “only 2 contacts of contacts developed EVD [Ebola Virus Disease] suggesting ring vaccination is effective in preventing tertiary generation of cases,” the analysis asserts. 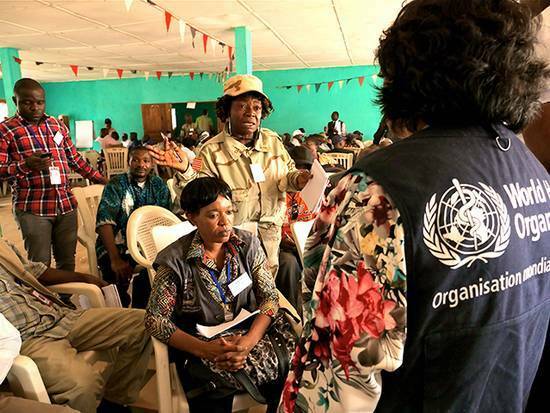 According to a WHO FAQ, the strategy has thus been shown to be “safe and protective against the Zaire strain of the Ebola virus,” and is recommended by WHO’s Strategic Advisory Group of Experts on Immunization (SAGE). it is also important to vaccinate health care workers in affected areas. While not yet commercially licensed, the vaccine is being used on a “compassionate use” basis, to protect people with the highest risk of contracting Ebola. Since the onset of the outbreak on 1 August 2018 though 25 March 2019, the analysis notes that there were 951 confirmed and probable cases of Ebola reported. Of these cases, the ring vaccination research teams defined 679 rings, including contacts and contacts of contacts, for 776 of the Ebola cases. “In all, 100,754 contacts and contacts of contacts were listed and 91,492 eligible individuals who provided informed consent were vaccinated,” amounting to 90.8% of all identified contacts. Additionally, 28,888 health care workers and front-line workers were vaccinated. “Due to security reasons and lack of consent from communities,” however, “it was not possible to define rings [for] around 175 (18%) of the cases of Ebola virus disease occurring during this period.” The ring vaccination coverage in relation to the number of confirmed and probable Ebola cases is detailed below in Figure 1 from the analysis. Figure 1: Number of confirmed EVD cases by the national surveillance system of DRC, number of cases included in the ring vaccination and, number of cases among vaccinated individuals. 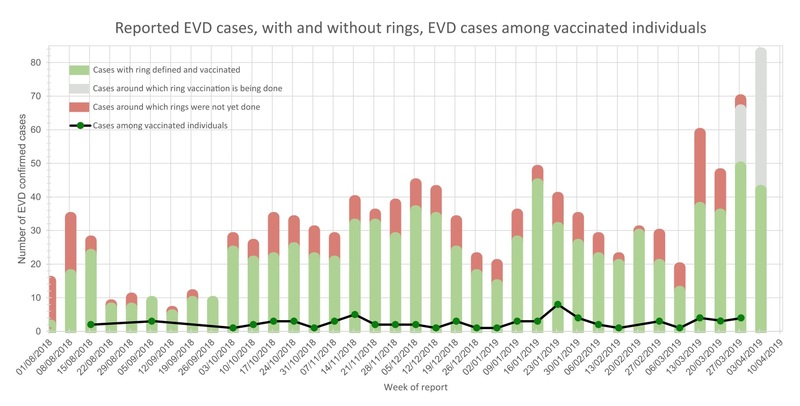 Ring vaccination tracks the likely spread of the Ebola epidemic by identifying individuals with an increased risk of contracting the disease due to their connection to patients with the virus. It then recruits them to voluntarily receive the Ebola vaccination. “The ring is not necessarily a contiguous geographic area but captures a social network of individuals and locations,” and is “composed of an average of 150 persons,” according to the WHO FAQ.